"This stuff is so beautiful and delicious, you and your Valentine may not even need the cake. 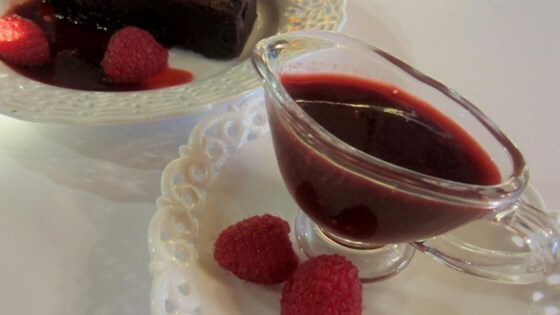 This will absolutely work even if you use frozen raspberries, but nothing compares to the flavor of the sauce if you can somehow find and use fresh raspberries." Depending what you're going to serve the sauce with, you may want to add some water before cooking the berries. If you want something a little thicker, to serve over ice cream for example, then don't add any water. On the other hand, if you want and lighter texture like I did, toss in a few tablespoons of water before heading to the stove. Be careful; we're not boiling and reducing the sauce, so we can't cook out excess liquid.